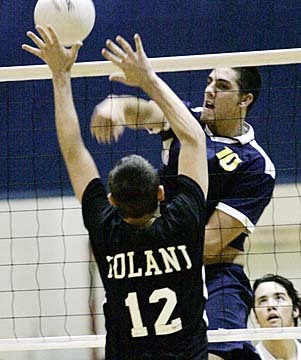 Punahou's Kealii Frank slammed the ball past Iolani's Joshua Starbuck during last night's match. Though often overshadowed, Punahou setter Riley McKibbin's efforts certainly don't go undervalued by his coach. McKibbin orchestrated an efficient Punahou attack last night as the Buffanblu boys volleyball team solidified its place atop the rankings with a surprisingly quick 25-17, 25-17 win over No. 2 Iolani in an Interscholastic League of Honolulu match at Punahou's gym. While All-State standouts in Punahou's Spencer McLachlin and Iolani's Kawika Shoji draw most of the accolades, McKibbin's ability to distribute the sets to a variety of Buffanblu hitters last night propelled Punahou (13-0) to its second win over Iolani (11-3) this season. "He set a great offense tonight and we passed the ball real well, too," Punahou coach Peter Balding said. "He gets lost in the (matchup between) Spencer McLachlin and Kawika Shoji, and those guys are deserving. But that's what happens when you play with great players like that. Those two guys are the two best players in the state. Riley just goes about his business, does his thing and we're the benefactors." McLachlin and Kealii Frank led Punahou with six kills each, while Matthew Brown added five. McKibbin put down four kills himself and had an ace. "The middles were on fire tonight," McLachlin said. "That was important because that separated the block and left me one-on-one." As his coach and teammates praised him for setting up the big win, McKibbin passed the credit on to the Buffanblu's passers, particularly the play of sophomore Erik Shoji. "It's really easy, especially when the passing is great," McKibbin said. "We've got Erik Shoji back there, he was awesome." Shoji, Kawika's younger brother, popped up several tough serves from big brother and got the Buffanblu fired up by diving into the front row of the bleachers to extend a rally that ended in a block by Frank in the second game. "Most of us have played against (Kawika) or with him for a really long time, so we know what he's capable of and our intensity goes up," Erik said. "I just feel like I know where he's going to serve it because he's my brother. I just try to pass it the best I can." While Punahou's passing allowed McKibbin to run the Buffanblu offense, the serving disrupted the Raiders' rhythm. "They served tough and we had a hard time passing consistently," Iolani coach Mike Among said. "We tried to serve tough and they took our best shots and they were able to run their offense. They took us out of our offense pretty easily. "They ran a few new plays tonight moving guys around, but they're just very efficient in what they do. They pass, Riley does an excellent job giving their hitters great balls to swing at and they swing effectively." Barry Kang led Iolani with seven kills, while Kawika Shoji had three. With the score tied at 11 in the first game, Punahou took control with a 6-1 run highlighted by a kill by McLachlin followed by a block by the junior. The Buffanblu maintained a controlling lead throughout the second game, which ended with McLachlin and Frank combining for a block on Kawika Shoji. While the win put Punahou in command in the ILH title race, Iolani still has some work to do to secure the league's second state-tournament berth. The Raiders close the regular season with matches against Mid-Pacific, Kamehameha and Damien. Top-ranked Iolani (14-0) pulled away in the third game and remained undefeated in the ILH with a 25-16, 17-25, 25-20 victory over No. 3 Punahou (13-2). The teams traded lopsided wins in the first two games and were deadlocked at 13 midway through the third game. But Iolani went on a 9-1 run to take control and held off a late Punahou rally to secure the win. "Our girls just had to get settled," Iolani coach Luis Ramirez said. "We started so strong, and the second set we lost focus. And in the middle of the third set we were able to put it together." Sophomore Leinani Keanini hammered seven kills in the third game and Megan Burton added four. With the win, Iolani avoided having to face Kamehameha on Monday and now has a bye in the first round of the ILH tournament. Iolani broke out to a 6-1 lead and cruised to the win in the first game. Punahou returned the favor in the second, also taking control with a 6-1 advantage. Neither team could get much breathing room early in the third game. Punahou led 13-12 when a kill by Lauren Minkel tied the score and sent Iolani on its decisive run. Trailing 24-17, Punahou strung together three straight points with kills by Shawna-Lei Kuehu and Elizabeth Kaaihue sandwiched around an ace by Anuhea Keanini. But a kill by Iolani's Chelsea Ching ended a long rally and the match.